If you want to lose weight without hitting plateaus, this article will show you common habits that slow down metabolism. How fast you lose weight is greatly determined by your metabolism. If your metabolic cycle is working fine, well congratulations, you’re going to lose weight. In other words, the complicated chemical processes in your body are all running smoothly. But nowadays, most people are complaining about weight loss plateaus and weight gain, and more often than not, it’s because their metabolism is messed up. And in practically all the cases, it’s our own habits and not some brand new virus, that is to blame. Most of us lead very sedentary lives that involve sitting for very long hours in front of a computer screen, consuming junk food and having an erratic self-care routine. Naturally our health declines, both physically and mentally, and we begin to stuff from stress and anxiety, as well as digestive and immune system problems. However, if we’re careful enough, we can nip the problem in the bud and return to a healthy lifestyle. All we need to do is change our bad habits, replace them with good and healthy goals, and our metabolism will skyrocket in no time. Many of us while trying to fulfill our new year’s resolution of losing weight fall into the trap of eating less in order to minimize the calorie intake. If you’re one of those people, rest assured that you’re not alone. Yes, if you want to lose weight, you have to burn more calories than you consume, but if you cut down on your consumption drastically, it is bound to create some problems, as several studies indicate. In other words, when it comes to losing weight, eat and live healthy, as per the requirements of your body instead of starving yourself. Yes, caffeine does have its disadvantages, but giving up on it, will only slow down your metabolism. In fact, as caffeine works as a stimulant, a little of it, can work wonders, increasing your metabolism by 5 to 8%, research shows. So what should you do? Enjoy a cup of green tea every morning before having breakfast. Dieting is crucial to losing weight and remaining healthy, but finding the right diet for your body can be tough. Experimenting with your body isn’t advisable. 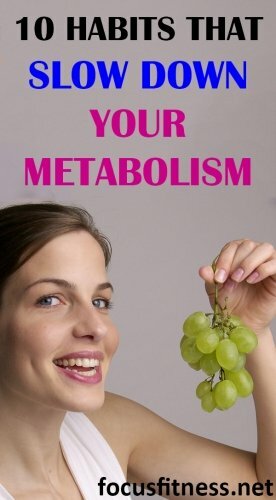 So if there are problems with your metabolism, take a quick look at the diet plan you follow. Are all the nutrients in right proportion? Are you eating too many carbs? Are you eating enough healthy fats? Particularly take note of your protein consumption. If it isn’t up to the mark, incorporate lean meat, plant protein, eggs and the like into your diet. As research shows, proteins not only give you the illusion of a full stomach but also accelerate your metabolism. Here are signs you’re not eating enough protein. I understand that you may be busy or exercise may not be fun for you. But if you want a happy mind and a healthy body, you have to do your bit, and that means exercising at least 3 times a week. If you find working out not ‘fun’ enough, try to make it fun- join a fitness group, getting a jogging partner, participate in dance and yoga lessons, etc. To make it lively and interesting, you can take on some workout challenges. And when you’re not feeling motivated enough, remind yourself of your goals and benefits of exercising. You have to be careful and more aware of how you live your life. And you can accomplish this by making very small changes. Instead of sitting most of the time, get moving. Do your work while standing at your desk, go for a walk during breaks, use the stairs instead of the lift, do some housework and so on. As per a study, such non-exercise activity thermogenesis (NEAT) can burn around 2000 extra calories every day. When they say that water is a universal solvent, they really mean it. Water can literally cure anything. In fact, the less water you drink, the unhealthier you become. Drinking at least 2 to 3 liters a day isn’t just advice, it’s a rule you should follow till your dying day. Decreased water consumption will lead to a host of diseases that we better not get into. Also as per a German research team – the temperature of the water is also important. 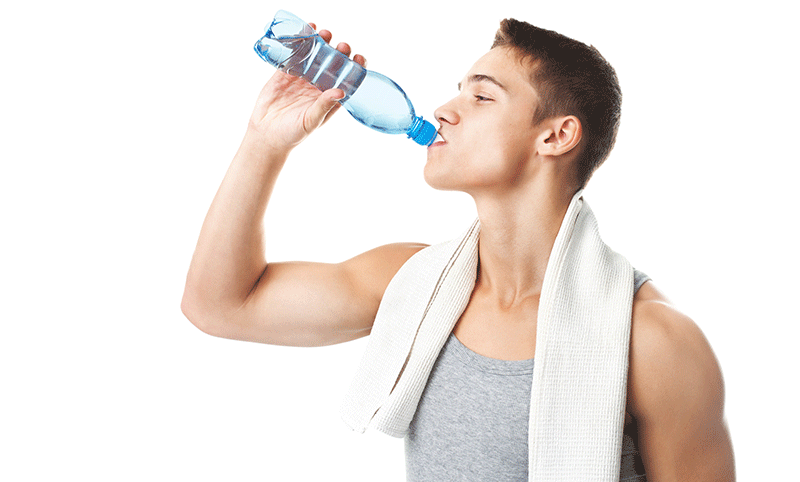 For best results, drink 6 glasses of cold water to up your metabolism. Stress will slow down metabolism because it puts different hormones out of whack. According to research, it raises cortisol levels, hinders thyroid function and increases leptin (hunger hormone) levels. All these hormonal changes slow down metabolism and make it harder to lose weight. So try your very best to remain relaxed. Go for de-stressing vacations, book yourself a spa session and take part in a digital ‘detoxification’ challenge. Make time for your family and hobbies and try to squeeze in more relaxation time in your schedule. You may pride yourself on being a night owl, but inadequate sleep will get you nowhere. For starters, you’ll be extremely lethargic and tired and unable to actually do productive work. In fact, the lack of quality sleep actually slows down your metabolism and triggers gain weight. And yes, you need 8-9 hours of uninterrupted sleep to boost metabolism and function optimally throughout the day. So sleep well. Do you have a sweet tooth? Well, you must learn to control that urge. Frequent consumption of soda drinks, mocktails, and other sweet beverages are bad as simply mean the early onset of diabetes and obesity. So lower your consumption of fructose-containing beverages. Switch to healthier alternatives such as smoothies or green tea instead. You don’t have to say goodbye to your favorite sweet beverages, but you can drink them less often. Iron works as a magic miracle that speeds up several chemical processes in your body. It works with oxygen to release energy and burn away fat. For women, in particular, iron levels tend to drop during menstruation and hence one must necessarily adjust their diet plans accordingly. A simple way to achieve this is to include more spinach, lean beef, shellfish and other iron-rich foods in your meals. This point also applies to those who suffer from anemia or similar conditions. Now that you know the common habits that slow down metabolism, this is your next step. Take a piece of paper makes two columns. In the first one, write down the unhealthy habits that you have and beside it, write a positive sentence on how you can change that. For instance, if you have an irregular sleep routine, you can write ‘Go to bed at 11 pm and set alarm for 6 am’ and so on. The next step is harder and involves you actually making a promise to yourself to stick to your new habits. Set small goals at first and gradually increase and improve upon them. Finally, commit yourself to a period of minimum of 21 days to develop and perfect a new habit. Most studies say it takes around 3 weeks to replace an old habit, and once you cross the initial benchmark, you’re good to go. Which of these habits do you think is slowing down your metabolism?